After some quiet time in the recruiting world from mid to late August, things have gotten back into full swing, as prospects being to make plans for campus visits and even make commitments. While the fall period is just getting underway, we’ve seen three Buckeye State players make commitments to Division II colleges, while others are on their way to Division I campuses for visits. Here’s the latest from around the state…. Esa Ahmad – ’15 Cleveland Shaker Heights PF: Ahmad continues to be one of the hottest names in the Midwest recruiting world heading into the fall, and his name has been all over headlines the past few days. First, the Cleveland senior cut his lengthy list down to just five schools, as Ohio State, Maryland, West Virginia, Wisconsin and Oregon made the cut for the forward. While Ohio State, Maryland and West Virginia have been considered the major front-runners in the Ahmad race for a while now, Wisconsin is a team that arrived late to the party, but must’ve piqued Ahmad’s interest to make the list. The Oregon Ducks are the surprise team on the list, and it will be interesting to see if they can lure Ahmad across the country for a visit. Ahmad then made more news over this weekend, when he took his first official visit, traveling to the University of Maryland to visit the Terrapins campus. Coach Mark Turgeon’s staff has worked really hard in their recruitment of Ahmad, and some rumors have placed Ahmad at Maryland with his close friend Kipper Nichols (Cleveland St. Edward), who the Terrapins have also offered. One of the other Big Ten programs on Ahmad’s list, Ohio State, is also beginning to make a hard push for Ahmad, as the Buckeyes are in greater need of a versatile forward with the decommitment of Mickey Mitchell, another nationally ranked forward who hails from the Dallas area. For as much as folks are going to follow Ahmad’s recruitment in the next couple of weeks, it will be equally interesting to track the development of his Shaker Heights team heading into the winter season, as the Cleveland area team got much stronger this month with the incoming transfer of former Cincinnati Fairfield post Justin Johnson, a high upside big-man who moved up to Northeast Ohio with his family to closer to his brother, Isaiah Johnson, who plays for the University of Akron. 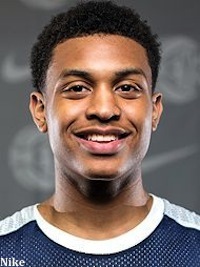 Jalen Avery – ’15 Cincinnati Shroder PG: The recruitment of Avery continues to escalate this fall, as the senior from Cincinnati took his first visit to a high major school over the weekend when he traveled down to Knoxville for elite camp at the University of Tennessee. Along with the Volunteers, Avery is also hearing from fellow high major Maryland, who is also in the market for a pass-first point guard like Avery. While Avery has been all over Ohio in recent months, taking visits to Miami (OH), Wright State, Ohio University and Kent State, the recruitment of the point guard seems to be on the verge of attracting some of the bigger schools in and out of the Midwestern region. Fairmont State, a well thought of Division II program out of West Virginia, has been active in recruiting Ohio since bringing on head coach Jerrod Calhoun, a Cleveland VASJ alum, a couple of years back. This past month, Calhoun has used his Ohio connections to his favor, as he recently secured two commitments from talented forwards. First, Fairmont State got a verbal pledge from Clinton Massie small forward Corey Saddler, a skilled and athletic wing forward who had a great 17u AAU season with Ohio Varsity. The, just days later, the Fighting Falcons scored another Ohio prospect in Dayton Ponitz forward Troy Cantrell, a big time athlete who spent the spring and summer with upstart program Ohio Elite. The combination of Saddler and Cantrell gives Calhoun two versatile pieces to use in the future at the forward spots, with Cantrell having the explosiveness to influence the game and Saddler being a hidden gem who can shoot it and has a polished skill set for a 6’6 player. Mitch Loomis – ’15 Malvern PF/C: Like Saddler and Cantrell, Loomis also made his college decision in the last few days, making a Friday night commitment to Lake Erie, a Cleveland based Division II school. Loomis, a 6’8 stretch post player who can really shoot the ball, had another solid AAU season with Team Work, and received significant recruiting attention from Division II schools because of his ability to make plays in pick-and-pop situations. In the end, proximity could’ve been a major influence on Loomis’ recruitment, as Lake Erie sits less than one hundred miles from his Malvern home, which is near the Massillon area. Khalil Iverson – ’15 Delaware Hayes SF/PF: Iverson took his first of the five NCAA permitted official visits this past weekend, heading from his central Ohio home to the northwestern part of the state to visit Bowling Green. New BGSU coach Chris Jans looks to have potentially made Iverson a priority in the 2015 class, as he was able to get the athletic forward to make the Falcons his first official visit. After showcasing his athleticism and college ready strength on the circuit with Ohio Varsity this past spring and summer, Iverson attracted offers from UNC-Ashville, Winthrop and BGSU, while also gathering some interest from other regional low and mid major programs at the Division I level. If Iverson can prove this high school season that he is capable of developing the necessary ball-skills to play the small forward position at the next level, he likely will accumulate event more MAC and Horizon league interest, should he decide to wait until after the season to make a commitment. A couple of class of 2016 Ohio prospects also made recruiting news this weekend when AAU teammates Roderick Caldwell and Jalen Tate both received their first Division I offers. Caldwell, who recently transferred into Huber Heights Wayne in the Dayton suburbs to run the point guard position for a very talented team, received his offer from Miami (OH). The Redhawks had been monitoring Caldwell for some time now, and decided to extend scholarship offers to two point guards in the former, as well as Perry County (KY) lead guard Braxton Beverly. Tate, on the other hand, received his offer from Kent State, as the Golden Flashes seem to have a good feeling about the versatile wing from Pickerington Central. The Columbus area junior finished off strong in the AAU season with All-Ohio Red, even manning some of the point guard duties at times, as Caldwell sat out much of July with a wrist injury. Couple of Kentucky commitments to keep an eye on: Both Boyle County combo guard Tyler Hagen and Newport Central Catholic post Andrew McDonald verballed to Northern Kentucky in the past few days. Hagen is a skilled scoring guard who had a very nice AAU season with KY Hoop Dreams, while McDonald, who ran with the KY Travelers, chose to stay local, as NKU sits only a couple of miles from his high school. Also, Louisville Manual wing Dwayne Sutton, who had a breakout spring with Travelers in the Nike EYBL, also made a Division I commitment, choosing UNC-Ashville over several other interested low and mid major programs.